The Chicago Special Mushroom, Spinach Pizza is the highlight of the menu. 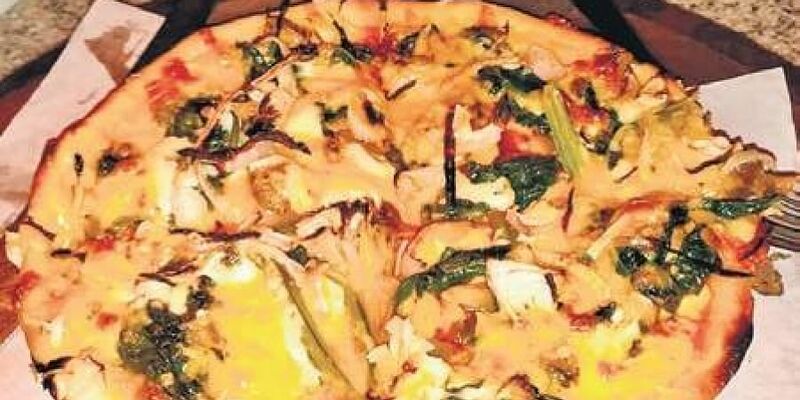 The deep-dish pizza, which is a rare find in Bengaluru, is a meal in itself. BENGALURU: The Yellow Submarine on Bannerghatta Road takes you by surprise. The distinct flavours of its food and combination of ingredients in its dishes, named after rock/pop songs, are fascinating. And just as the name suggests, the decor is inspired by submarines. The Chicago Special Mushroom, Spinach Pizza is the highlight of the menu. The deep-dish pizza, which is a rare find in Bengaluru, is a meal in itself. The chef tells us that the pan in which the pizza is baked gives the crust a high edge, giving a lot of space for cheese and tomato sauce. Indeed, it is very ‘cheesy’, but the creamy flavour of the cheese is balanced with the bitterness of spinach. The dish has an earthy flavour of moist mushrooms, so moist that water seeps out as we take a bite. The starter Whipped Cottage Cheese Tikka in Lettuce Cups is as interesting as it sounds. Garnished with orange ginger glaze and pickled carrots, it tastes fresh and crunchy at first and a little tangy later. The pickled carrots are salty. The lettuce is so fresh that a milky liquid oozes out as you cut it. The cottage cheese has a mild flavour and has a soft and heavy creamy texture. The Sriracha chicken is spicy as the crispy chunks of chicken are tossed in the chilli sauce of Thailand. Another starter Lotus Stem Chips will also get you sweating. Though it tastes sweet at first, the crispy chips tossed in chilli, coriander and plum, get so spicy that it makes it difficult to taste and recognise the flavours of the dishes you try next. It is served with raw mango and papaya salad. 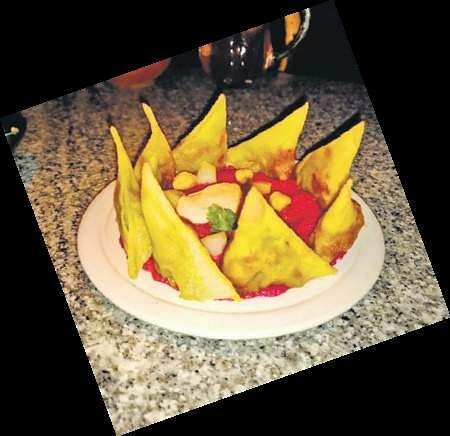 The Samosa Hummus is a favourite. The mini-onion samosas served with beetroot hummus, smoked paprika, cream and pickled cucumber, is a relief after the spicy chips. Dip hot samosas in earthy beet hummus, as it is comforting on a rainy evening. 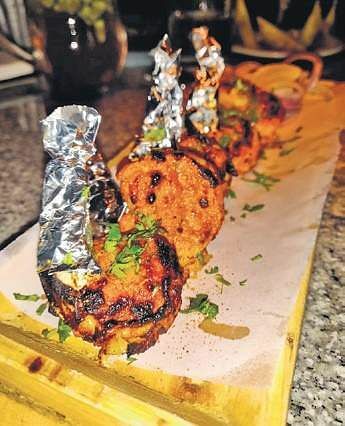 Tandoori prawns is a must-have for all seafood lovers. The tiger prawns cooked in tandoor masala are grilled to perfection and comprise distinct flavours. It is the best tandoori prawns one can have in the city. Their microbrewery serves different kinds of beer each week. The dark porter beer has a bitter coffee-like taste. Being Bryan Adams fans, we order the Summer of 69. The vodka-based cocktail has plum, cucumber, basil leaves, lime juice topped with ginger ale. It tastes a bit of sweet cranberry at first. Towards the last sip, the flavours change to that of a mild melon due to the cucumbers in the drink. Another cocktail Across the Universe is named after the song of The Beatles. The drink, again vodka-based, has betel leaves, rose petals, rose water, grenadine, rose syrup and mint syrup. It has a raw and peppery leaves and tastes just like paan, so proceed with caution. You should order Coconut Woman for its stunning presentation. The rum-based drink is served in tender coconut shells and garnished with dry ice. It has Cabo coconut rum, white rum, tender coconut water, homemade cardamom powder and watermelon chunks; and tastes and smells predominantly of coconut. You can look forward to the desserts on the menu. The Coldbrew Pannacotta has coffee flavour. It reminds you of the toffee coffee bite. But be careful when you try it with rum soaked raisins. It can get too bitter to taste. The toasted marshmallow on the platter comes as a great add-on to the dish. If you are a chocoholic, try Submerged in Chocolate. The dry dessert comes with five different kinds of rich Belgian chocolate and ice cream. Topped with chocolate sauce, it tastes both sweet and bitter.